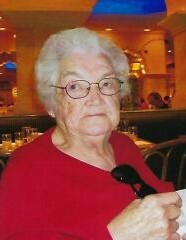 Marjorie Helen (O’Leary) McBreairty 95, passed away peacefully at her home on December 1, 2018. She is the widow of Clair Nathan McBeairty. Maggie was born March 2, 1923 in St John Maine, a daughter of the late John Edward and Isabelle (Jackson) O’Leary. Maggie was the matriarch of a very large and blessed family and her impact will live on through many generations. Maggie is survived by 3 daughters; Kaye Knipe of New Milford, Miney (Edward) MacKenzie of Southbury and Lorraine (Edward) Burns of New Milford; a sister MaryAnne (Joseph) Jackson of Friendship, ME; a son-in-law: Robert Colburn of New Milford; 2 brothers-in-law: Vaughn Harris of Brewer, ME and Vincent McBreairty (Theresa) of Dundee, FL; ten grandchildren, 18 great grandchildren and many nieces and nephews. She is predeceased by a daughter, Glennis Colburn; son-in-law Robert Knipe; six siblings: Joseph, David, Glenn, James, Ella Campbell and Patty McBreairty. The family will receive friends Saturday December 8, 2018 in Colonial Funeral Home 87 PK.LN.RD., New Milford, from 11:00 am until 1:00 pm. Prayer service will begin at 1:00PM. Interment will be in the spring at St John Bible Church Cemetery, Fort Kent, ME.